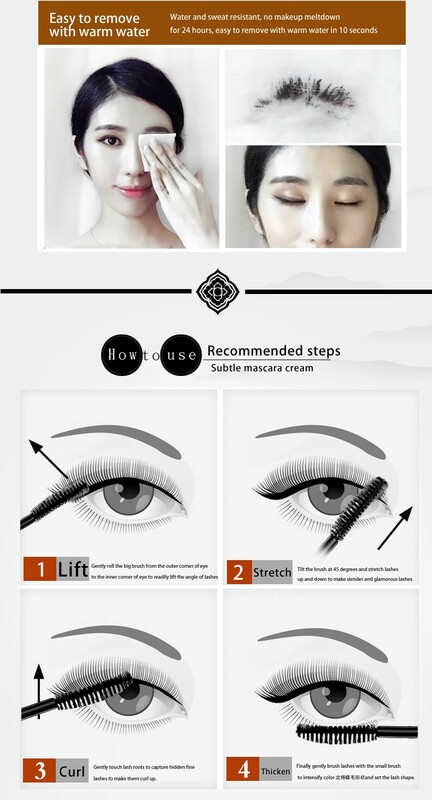 Magnify your eyelashes in a few seconds. Get bold, voluminous eyelashes with this waterproof, long-lasting mascara. The two sides of this brush gives you your biggest, boldest lashes yet. The big, spiral side extends your upper lashes so they appear longer and thicker. The small side captures finer hairs to contour your eyes and give them volume. This make-up brush is so easy to use that even beginners will have success creating that false lash effect. Turn heads without breaking the bank. This mascara brush is a must have for any make-up collection and is ideal for both professional and personal use. Give as a gift to family and friends. - Rich black and curled sophisticated eyes. - Enrich and thicken lashes. Nourishing and moistening. Thicken lashes with lasting fix. - Long lasting and smudge free. - Easy to remove with clean water. extra long reception. fits well, hot facial, no allergy for now. the brush that makes it less some packages. all like in description. three. as gift for thank mask eye skin. and recommend seller. only nice impression, mascara have quality. packed in a box, made добротно tube inside. original shape tassel, very convenient to use. all super!